Hi Andrew, I would like to propose a few feature suggestions for Bandwidth Manager. 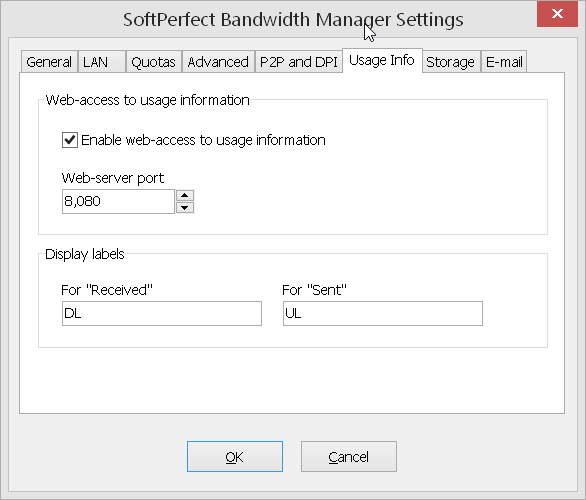 After purchasing an enterprise licence and using the software for a number of months I would like to mention some features that could be considered to make Bandwidth Manager an even better product! I have user devices added by MACs in groups with these groups assigned to rules. Each of these rules (one per user) have a monthly quota assigned to follow the ISP data quota period. This in turn allows me to restrict each user to have say 50GB of Internet data per month. 1. Ability to specify when the monthly quota resets by time AND day. It currently supports the day (date) of the month but not the time. E.g. 10th of the month at 11:30PM. a) Due to time zone differences my ISP resets my quota at 11:30PM, while Softperfect Bandwidth Manager resets the quota at 12AM on the set day. As it stands I have to manually reset all rules or the users have a window of 30 minutes to start eating into the new quota without being monitored for it - example - data counts to the last month quota in BM, while it is coming out of the new month's quota. 2. At the point of the auto reset period for the quota (example my quotas are set per month), have the option (check box?) to have the rule also auto reset so the stats and web interface for the rule is cleared at the same time. a) Currently the stats just continue on so users can't see what they have used for the current quota period via the web report. It just ends up being a running list. To clear the records to align with the quota reset period (again monthly in my case), I have to manually reset the rule at the exact moment the quota resets. 3. Have a type of rule "suspended" rule that can auto activate at a time (start/ finish) / day (date) that is selectable. a) To explain: Sometimes I have data left on my account the day before the ISP resets the quota. Having a timed rule would let me assign a quota of say an extra 10GB that can be set to take over the primary rule for a user on the last day of the quota to "boost" their allowance (and use up the remaining data on the connection) but only for that last day and then switches off when the time frame is up so then the original rule resets and gives the normal quota allowance. e.g. -Rule "Extra data" - 20GB/Day - Rule in effect from 9th 12:00AM - 9th 11:29PM, then auto disables so the "higher" normal rule takes over again. 4. On the web reports, instead of just displaying the percentage for the set quota remaining, also include a text data display - by which I mean - "Quota Used: 50% - 25GB/50GB". This then allows the user to see how much they have used vs remaining in GB or whatever the quota scale may be – Mb, GB etc. a) Also a display for quota period progress - E.g. a text display: "11 of 31 days remain" would also be handy. For hours perhaps 11 hours of 24 hours remain. 5. Again, for the web reporting interface ability to swap received and sent so they match the user's perspective instead of the server. Currently "Received" means "uploaded" and "Sent" means "downloaded". My users are terribly confused by this. 7. When several devices are added to a group, then applied to a single rule (Source - group e.g. "John Johnson Devices" in the admin console display each device under the rule like streams that shows data transfer for each of the devices in the group. At the moment the admin can only see the group as a whole, not how much data each device in said group is consuming. All the devices in the group "John Johnson Devices" have been named - iPhone, Printer, Laptop, desktop, iPad but I can't see what each device is using, only the group as a whole. Perhaps each device and its data usage could also be shown under the web interface for the rule. That way the user and admin can see which device uses the most data for that rule if several are in the group. Out of all the above, for myself I feel 1 and 2 are the most important for me as currently I have to manually reset each rule at the end of the quota period (monthly) or a window exists where users take advantage of "free" data. Having the ability to define what is considered monthly (or daily etc.) would allow BM users to align the system to their ISP quota periods. I hope perhaps some or all of these may be considered for addition into the wonderful tool you have created. So far it has helped me manage the Internet usage on the network. Let me know if you require any clarification on any aspect. Items 4, 5 and 6 have been implemented in the new build. I guess this also solves issue #2 as now the users can see what they have used for the current quota period? Thankyou for update! I have just installed the new build. #2 – The “Total” used field is great on the web interface. Would it still be possible to allow a checkbox per rule to clear the records (i.e. reset the rule) as per the quota cycle? The reasons being for rules that aren’t quota based (i.e. just speed limited) the “total” display (I assume) would not reset as per the ISP data month and would keep going. I assume the “Total” field resets only resets based the quota period (and if there is a quota)? If this is implemented per rule as a checkbox “ e.g. Reset rule at end of quota period?” it would allow the choice on a per rule basis. #4 – The “Quota expires” and the up, down and total fields are great. Thankyou! Would you consider also adding to “Quota expires” display the remaining units? Example: 25 days remaining. This would show: “Quota expires: 25 Days – 9/03/2015”. I would say counting down would make most sense with such display. I find users like to see how many days at quick glance they have remaining to work out their usage consumption. #5 and #6 – This is perfect! The option to name this anything is really good. It simply deletes any records older than the specified period from the present day. What do you think? The “Quota expires” and the up, down and total fields are great. Thankyou! Would you consider also adding to “Quota expires” display the remaining units? Example: 25 days remaining. This would show: “Quota expires: 25 Days – 9/03/2015”. I would say counting down would make most sense with such display. I find users like to see how many days at quick glance they have remaining to work out their usage consumption. Agreed. I'll do that shortly. I see your point re not being linked to a quota. Funny, I didn't connect "keep usage records" to that display. Well, in this case, what if it is tied back to point #1 from the first post - "Quota resets by time AND day". So when for example, the "keep usage records" option is set to "1 Month", that 1 month period is determined by the date from Settings> Quotas > Monthly period begins on X and hopefully if you can add it in, the new month time (#1 from my first post). I say this because ISP quotas generally do not reset on the first of the month, in my case the 9th. This would then follow the ISP quota cycle. That way soon as say the 10th at 11:30pm as set in Settings> Quotas > Monthly period begins on... comes around for example, all rules will reset in the GUI and web interface, hence clearing usage records and resetting the Total and associated displays with it as we have set "Keep usage records for 1 month". This is also when the quotas would reset (current BM quota reset behaviour). To achieve this (resetting the running stats) at the moment I have to manually reset the rules at the exact moment the quota resets. This could be made to only apply to certain rules (if user desires) with the use of a check box per rule, e.g. 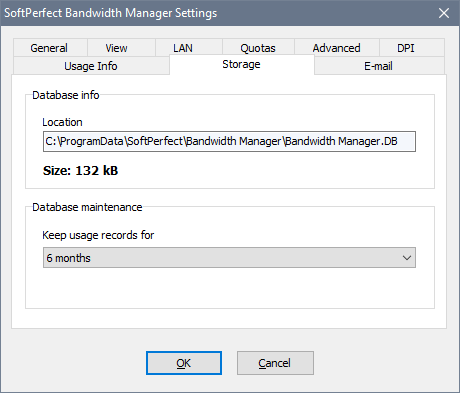 "Reset Rule with Usage Records Retention Length" from the "Keep usage records for 1 Month - which as mentioned is looking at the date and time set in Settings> Quotas > Monthly Period begins on. This would mean all records are reset in accordance with the monthly or other selected period. Basically it would be the same as right clicking on the rules, hitting Reset Rule. This could be aligned with the quota options of "an hour, day, week, month etc" but the hour and day options would have to be added to the Settings> Storage> Keep usage records for... drop down list. Did I explain this well haha? Awesome stuff Andrew. Much appreciated! I am glad to announce that we've released version 3.1.0. In addition to the changes you have already tested, this release also takes into account the current quota when displaying per day records in the web-report. For example, for a per month quota, only the current month's records will be shown. I guess this should satisfy your need to show the customers only the information relevant to their quota. Unfortunately it's not possible to implement #1 to resolve the issue with a 30-minute difference with your ISP because in the current BM's design the minimum time unit is 1 hour. I guess I would suggest to set the server's timezone to that of the ISP. This should resolve the 30-minute gap in records, though your customers will also need to know about this 30 minute difference. Thanks for the update. I have updated BM and will test it out. That’s great about the current period stats, thanks. I have set the Storage > Keep usage records for 1 Month. Do I need to change this back to default or I can leave it at 1 month? Re #1: No worries. The clock adjustment should do the trick, thus solving that issue. 2- solved – Will the rule stats in the admin console auto reset with the quota also? 3- Is this possible to implement at some point still? 6- Solved – I have found that in the “Usage Report” and “Live Usage Monitor” it still uses the old sent/received and in/out terminology. Perhaps this can be changed to follow the custom label fields that you have implemented? 7- Is this possible to implement at some point still? You can leave it either way. It now simply reflects how long are usage records kept in the DB. Do not set it shorter than 1 month though as this would break monthly quotas. I have found that in the “Usage Report” and “Live Usage Monitor” it still uses the old sent/received and in/out terminology. Perhaps this can be changed to follow the custom label fields that you have implemented? Yes, these were just forgotten I have updated the installation package and you can download the corrected builds from the home page. With regards to the wish-list, #3 is actually partially implemented. Is this suitable for your goal? #7 may be at a later stage, but this would be pretty much duplicating the already existing tracking feature. When tracking is on, devices in a group are monitored individually, yet this also means each one of them has its own quota. It's close, I think it needs an option for the exact date, rather than before or after. Example: only active for the 9th of the month. I also it appears to be constrained to the exact month (ie 9/3) rather than the 9th of each month. With this said, it looks to be exactly that feature area though. I guess it would just need an option for “Exact Day”, and set a day of the month like the 9th. Then it would trigger that rule on the 9th of each month at 12am-12am. Otherwise everything is working perfectly! I see what you are saying, however perhaps it could also have the option to just display the devices and their usage without giving each device a quota also? So you could see the breakdown each device's consumption of the overall rule quota. I guess it would be a selectable option between the stream tracking or display. The reason I ask is, I get users asking which of their devices are using the most. Sometimes it's good to know which devices in a rule (group) is using the most data. I have fixed the remaining two places with the Received/Sent labels and also added a new type of date binding: Download latest build. It's worth mentioning that when it's set to go off on the 30th or 31st, while the current month is shorter, it will go off on the last day of the month instead. Please let me know how it works for you. Yep, labels working well now Thanks for that Andrew. Re the date binding - This looks exactly what I was after. However, when I apply that option and click "ok" on the Add/Edit rule dialog, I get "Please specify Schedule as it is required." I take it this shouldn't be happening? Or have I done something wrong? This date binding feature is linked to another one called the Schedules. 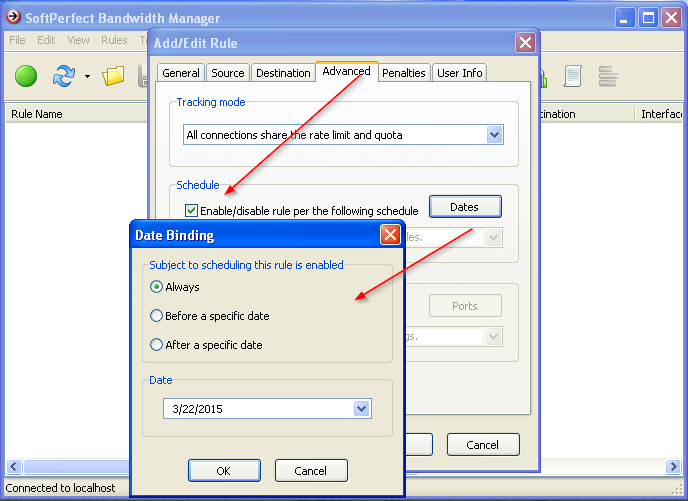 Simply create a schedule, mark all days and times as active and then choose it at the Advanced tab in the rule's properties along with the day you want to activate the rule on. Exactly what I tried in the end. So it does require an "all on" schedule. No worries. The new date binding works correctly. 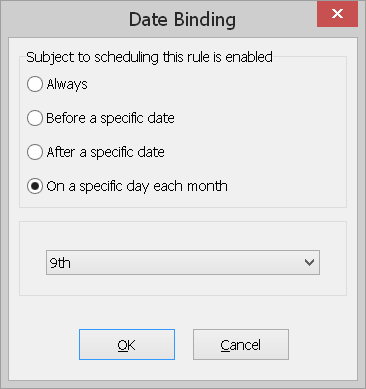 The rule enables and disables on the selected date. This will be a great help. Re #2 – Will the rule stats in the admin console auto reset with the quota period also? (Like the web stats do for the defined quota period now) Before the GUI stats would just continue on. I haven't been able to test this yet. The stats do not reset, the change I made for the rules with quotas is only the web-page output. In other words, it only print records relevant to the current quota's period. No records are removed from the DB. Would you consider having a global selectable option that wipes out all records once the quota period expires for the GUI? In effect, rule transfer stats reset to 0 in the GUI when the quota expires. Obviously rules may have different quota types so it looks at each rules' quota period and resets accordingly. The reason I bring this up is in my case there are many rules / users so I check the GUI to see how much the user has transferred for the quota period. As the stats continue on indefinitely that makes it hard to see from the GUI what each rule has transferred. It just ends up being a total. With an option, this behaviour could be selectable. Well it's possible to add an option like that, but perhaps it would be easier to watch the quotas being consumed in the Quota Usage column? Only issue is one can't see the usage in MB/GB etc at a quick glance, just a percentage in the colored bar of the quota set (which is hidden away in a menu). The final value then has to be calculated for each rule. At the moment it is very much like: Rule 1 74%. I think to myself, what was Rule 1's max quota? I then have to trace that quota down to that rule and work it out or view the web interface for the rule through a bookmark. For 30 + rules that becomes very time consuming. Its nice to sometimes see a total overview quickly rather than going to the web interface and looking up each rule for that info. In the case of rules with a quota that resets to a period, the perpetual data counters offer no information it no longer relates to the current period of usage. This makes sense, though I still think it's a good idea to retain records for a long time. Later on you may want to build some reports to find the most active users, or find out how the usage changed over months or even years. Here is another suggestion. What about having a choice of what to display in the Quota Usage column: percentage used or numerical values like [2GB of 10 GB]? I could easily add this option.